Please note: Reviews for Quickies/Short Story Saturdays are spoiler-filled. 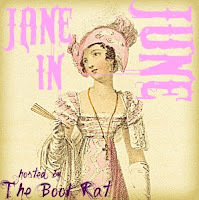 A Good Vintage Whine fills in a moment between Bingley's propsal to Jane and his return to the Bennet household with Darcy in tow. In the story, the Bennets were actually supposed to come to dinner the night before the men show up for breakfast, but when Bingley and Darcy descend into the wine cellar to pick out a port for Mr Bennet, something falls against the door, trapping them in the wine cellar until they can be discovered many, many hours later by the household staff. And what are two Regency men to do, trapped for hours in a room, surrounded by wine? Drink and drink and drink some more, and perhaps let a few secrets slip. Earlier today I reviewed the story A Long, Strange Trip, in which the Netherfield party and the two eldest Misses Bennet accidentally imbibed psychedelic mushrooms. Apparently the theme for today is Austen characters high out of their minds, because this story was all about watching them get sloppy drunk. And though I liked the first story more for sheer WTF? factor, this was a nice accompaniment to the whole thing. It was really fun to watch the boys let their hair down (and take their cravats off), and get an unexpected and unintentional glimpse into their minds. This is true of Darcy especially, as this scene takes place just after Lady Catherine has visited at Longbourn and just before Darcy has made his continuing love known. It's pleasantly realistic to think of him, slightly tipsy and a tiny bit melancholic, listening to Bingley speak of Jane for the hopes that Lizzie's name will enter the conversation. And the way her perks up whenever it does is believable and lovely. On the whole, the premise for the story is kind of absurd (it is rather hard to believe that, had things really happened this way, no mention would have been made in P&P of the fact that the Bennets had gone to Netherfield and been greeted to a solitary dinner when the master of the house failed to show up. I think this would have caused quite a stir); but the things that it allows to happen and to be expressed give it a fun "this could have happened" air. And I have to say, seeing the always composed Mr Darcy slip up a bit is rather nice. I think that's part of what makes his first disastrous proposal in P&P so delicious. 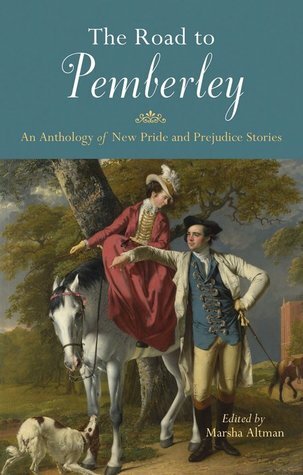 The Road to Pemberley , edited by Marsha Altman. Ulysses Press, July 1st 2011. Looks like a good story! I, too, like when Darcy's control slips a bit and you see that he is a vulnerable, emotional person under the stare. I wonder what a drunk Bingley is like, though, because he is happy and friendly all the time anyway. I 'm looking forward to reading all the stories in R to P.